2. Add the squid and green chillies. 3. Fry over low heat. 4. Mix the ground paste with 2 tblsp water and add to the pan. 5. Mix well and cook till water evaporates. 6. Add salt and when dry, remove from heat. 8. Garnish with coriander leaves or spring onions and serve hot with chilli sauce. 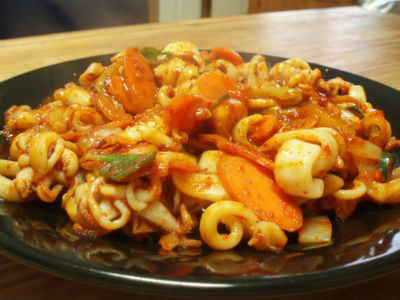 Feel free to comment or share your thoughts on this Stir-fried Squid Recipe from Awesome Cuisine.